Simone - the trip to the palace and gardens was spectacular! We thought we might be overwhelmed after two days of tours - but it just got better and better! We loved the history and how we could relate to all of it from day to day and place to place. You just did a GREAT job! The lunch at the beer garden was so much fun. We loved how relaxed each day was and were amazed at how much we knew about Germany and history when we were at the end. We hated to end our tour and look forward to another! TOUR GUIDE RESPONSE: Dear Barbara, I am so happy you enjoyed our three day tour together, it was really so much fun showing you every day something more, adding more pieces to the puzzle! Thank you for being such wonderful, warm people - I'll miss you and hope we'll meet again one day. After all Ludwig built yet another castle!! Simone - OMG - we loved the day to the castles with you! We were able to add to the history you gave us the previous day and just felt like we lived in that era with its elegant ways and interesting people. Lunch at the cheese restaurant was amazing - we will remember the wine, bread and cheese for a long time. Even the long car ride to the castles was so much fun and informative. We have such a good idea of Germany and feel like we can be better world citizens because of that knowledge. TOUR GUIDE RESPONSE: Dear Barbara, I cannot express my gratitude for this long day with you, the many stories we shared, the various topics we discussed - and your absolutely wonderful rating. From the bottom of my heart DANKESCHOEN! Simone designed a tour of the city just for my daughter and I that was fabulous. It included everything we wanted and she is so knowledgeable that we felt we really got a good view of the city as well as marvelous historic background. We were able to retrace some of our steps after the tour to get a longer time at some of the sights. We ate at a delightful Bavarian restaurant that we both loved (She had to account for my diet needs). We hope to return to Germany and to have her as a guide. Simone was a wonderful guide. Great personality and knowledge. She had great stories about historical places and a very helpful picture book. We thoroughly enjoyed our day with her even though it was cold and snowy for most of our outing. Simone was thoughtful of the weather and kept a fun atmosphere! We booked a very short tour during a 6 hour layover at Munich Airport. Simone was a good communicator, was on time and gave us a fun little tour of Munich. We requested to stop for German beer and she accommodated on the spot. We took us to the palace and old town and showed us the hidden treasure inside the church that we never would have found on our own. We did 2 tours with Simone and loved them both. She made the city come alive for us with her wealth of knowledge. We loved the little anecdotes that accompanied the historical facts. She was infinitely patient with our 2 rambunctious boys. Spending time with her in a city new to us was like having a friend show us around. We felt relaxed and well taken care of. Her car was also super comfortable in the cold weather! We would highly recommend her services! Simone is extremely personable and knowledgeable. We greatly appreciated how flexible she was. When we met I asked her if we could cover some historical sites outside of the city center. Simone made a great suggestion to accommodate my request. We only had one day in Munich and spending a few hours with Simone was the perfect way to learn about Munich. We had a lovely Best of Munich private tour with Simone today. She is incredibly knowledgeable about the history of Munich and had an answer to every question we posed. We appreciated how efficiently she used our time. We learned so much in such a short period of time and Simone gave us suggestions and recommendations to make the most the rest of our stay. She is such a warm person that you quickly feel that you are spending time with a friend instead of a stranger. Highly recommend! We did 2 tour days with Simone and we have a great memorable experience. Our second day with Simone was another 6 star day. Driving thru the German countryside on the way to Ettal and then Neuschwanstein with a stop in Oberammergau was outstanding. Simone is the consummate professional - historical knowledge, an immaculately clean car for her guests, and a thorough knowledge of the sites and the area. Her English is excellent and her overarching goal is to provide value to her clients. We were overjoyed with Simone as our guide for 2 days and would strongly recommend her. Simone was a six star tour guide. The morning walking tour of Munich went from plaza to plaza with the history of each. An early morning stop at the German donut place (don't recall the specialty) for freshly cooked donuts that were superb! Later in the day the lines were out the door. Lunch was at one of the local beer halls that was also a brewery and was very Bavarian and excellent. In the afternoon we had a somber tour of Dachau and Simone excelled in her knowledge of Germany and its dark past. Simone was extremely well organized and our tour ran seamlessly. Simone is knowledgeable, friendly, personable, helpful, accommodating and informative. She went above and beyond to insure our day with her was amazing, enlightening and memorable. Simone was a fantastic guide; knowledgeable, accommodating, fun. Our family had a great time with this tour. Simone was a pleasure to spend time with, and we got a taste of so many of the different goodies that Munich has to offer. Thank you Simone! Remarkable few hours in Munich with Simone seeing the city sites and hearing about the history of this magnificent city. We even had time for a beer in a traditional Beer Hall. Simone took us back to the airport after the tour to catch our flight to Singapore. If you have a lengthy stopover in Munich, try a walking tour ... it is brilliant. Simone was very personable and attentive, but my boys and I didn't think she was as historically informative as the other tour guides we used in Germany and Poland....and we were there for the history. Yesterday we had a tour with Simone. We toured some historic parts of Munich and did a tour of Dachau with her. Simone had fantastic knowledge of her city and told very interesting stories regarding the history of what we saw. She handled Dachau with such dignity and respect while giving us a great tour and understanding of the area. I would strongly recommend Simone for anyone coming to Munich....she was friendly, interesting, knowledgeable and fun to be with! Simone is an incredible tour guide. She is from Munich and has impecible English. She is very informative and has a great sense of humor. I HIGHLY recommend using her! Our family had a wonderful time touring Munich with Simone! She met us at our hotel, which was very convenient for us as we were not familiar with the city at all. Simone was punctual, friendly, courteous, and very informative. We got to see so much with her! Part of the tour was taken in her clean, comfortable car. We appreciated Simone's excellent English language skills and her pleasant personality. If we are ever lucky enough to visit Munich in the future, we would hope to tour again with Simone! We felt that Simone was the perfect guide to lead us through the streets, churches, and markets of Munich. She was very thorough with the historical background of the city and the German monarchs. She has a delightful personality and we were very pleased with this tour. Simone did a great job! TOUR GUIDE RESPONSE: Thank you Valentina for choosing my tour and your rating! Greetings from Munich to California! Great way to spend our limited time in Munich. Simone was timely, personable and well-informed. She tailored a private tour to exactly our needs. Based on our first experience with Simone, we look forward to using Tours by Locals in other locations. Simone is a wonderful tour guide. She is extremely knowledgeable and engaging. She really does go the extra mile in making the tour enjoyable and memorable. Without hesitation, I would highly recommend her. Thanks Simone! My husband and I, with our two 20-something sons, took this all-day tour. Simone is TOP SHELF! She picked us up at our downtown hotel and wisked us away into the countryside. she is an excellent driver and handled the autobahn while getting to know us in an artful way. Her compassion and intelligence were evident. The beginning stops were very interesting, but the show stopper is Neuschwanstein. Simone had fascinating information to share about the castle and Ludwig. HIGHLY RECOMMENDED! Simone is a wonderful, happy and knowledgeable guide who gave us great incite into the history and development of Munich. She was flexible and accommodating and entertaining! Totally recommend her and her well planned tours as a fabulous introduction to Munich. Simone was excellent, thoroughly professional, knowledgeable and personable. Would highly recommend her services. Munich is a beautiful city; we should have stayed longer and spent more time with Simone. Good walking tour of the city center / squares with the chance to taste some "gluwein " and great recommendation for dinner at a local brewery . (Lots of plazas in the Squares ..... after 3 or 4 they get a little boring ) but overall really great ! Oh my goodness.... Simone was amazing! So friendly and so knowledgeable about the area and the tours. She was great with my questions ...and I love questions. She was a great guide and I would definitely recommend her for any other person looking for a guide! Simone was better than fantastic. She arrived early (even though there was a snow storm). She has a great knowlege of the Munich history as well as current events. She was a pleasure to meet and she is very proud of her beautiful country(and should be). Her english is excellent. Thank you and if you come to USA she is welcome to visit us. Thank you again.Jack and Linda. We had a great time. Nice tour with main highlights of Munich. Simone showed us fantastic local stores :) which we enjoyed. Thank you very much! Simone was fabulous. She gave us a tour which fit our requirements. She is very thoughtful & extremely knowledgeable. We would highly recommend her to anyone who wanted a local tour guide in Munich. Thank you for the wonderful tour. Simone was an exceptional guide! She met us at the appointed time, was well prepared and took the time to not only show us some of the incredible food "neighborhoods" in downtown Munich but to also uncover some of the incredible history that this part of Europe and Germany have seen over the past several centuries. Her approach was fun, exciting, personal and full of information and ideas that were helpful during the rest of our trip. I would wholeheartedly recommend Simone for this tour. Simone was an awesome, well informed guide, even prior to my trip if I asked her a general question about Munich she was always kind enough to answer. She showed great enthusiasm and pride in teaching others about her country. It was a very enjoyable day, I would highly recommend Simone to anyone planning a visit to Munich! Simone is a great guide. She knows the city well and showed it to us from her car and then a walking tour. Excellent English and overall knowledge of the city and her country. She was flexible on our start time when we needed to modify it. Simone made Munich come alive for my wife and me during our recent visit, and definitely increased our appreciation of its history during the remainder of our stay there. Simone is a well-informed and enthusiastic guide who bore our many questions with great poise and perseverance, and supplied us with interesting information. If we return to Munich, we definitely would ask for her services again, and recommend her highly. She is very nice to boot. Phew! What a busy two days we've had. Even when we flagged our wonderful guide Simone kept going. She maintained a professional and personable attitude throughout, looking after our sightseeing needs and getting us where we had to go (and back)! Simone was an excellent guide. We have used Tours By Locals a number of times around the world, Simone with her smile, friendly personality and knowledge leads the field! Just a really excellent person and guide. Thanks Simone, see you next trip. Simone was a wonderful guide who carried out her role with professionalism. We were impressed with her knowledge of, not only of the tour focus, but 100's of other historical, geographical, local and global facts. We very much enjoyed her company and her friendship. She was on time, her vehicle was well maintained and clean; she herself, presented as well groomed. We were a party if three, Simone did an excellent job and fitted right in with our group. Our day trip with Simone was spectacular! We could not have asked for more. It was a fantastic excursion to Neuschwanstein Castle and Oberammergau. Every moment of the day was filled with picturesque scenery and expert information and knowledge of the history. Simone even recommended a fabulous restaurant at the end of our day trip. We were thrilled with everything and would highly recommend hiring Simone to enhance any excursion. Simone was extremely knowledgeable and friendly and made the tour enjoyable and memorable. She picked us up from our hotel right in time, brought us to a cafe, restaurant and the best Christmas shop in beautiful towns along the romantic road. Excellent tour ! Tour guide Simone was very knowledgeable , friendly and personable. This tour was exactly what I wanted. I couldn't have been more pleased with Simone. Simone had prepared a very good tour with quotes from publications from the time of Dachau. What could have been a very depressing experience turned out to be a thought provoking look at history. Great job!! This tour deserves more than 5 stars. Traffic was awful. There were multiple road closures that were not previously published and this was a long, long day. Simone was cheerful and adaptable. Because of the traffic problems and the length of time to return to Munich, we suggested that the tour be shortened. After determining that my husband and I were interested in all of the towns on the tour, Simone refused to shorten the trip. She was determined that we get the best Bavaria had to offer. Simone was very knowledgable and provided additional commentary beyond the castle's tour guide. Additionally, she found the most delightful little cheese shop for a fabulous lunch. Couldn't have asked for a better experience. Simone was extremely knowledgable and well organized. Simone went out of her way to be sure that we were comfortable. Both my husband and I had some mobility issues while in Munich and she adjusted her previously planned activities to accommodate us. Additionally, she was patient in helping my husband reacquire some proficiency in German. She went way beyond what was required. Our first experience with personal tour guides. Our experience was so wonderful, we will always do this in the future. If you are in the Munich area Simone is the guide to go to. She was fantastic, knowledgeable and a perfect guide for our day. She was able to provide us with a custom tour of Neuschwanstein Castle and surrounding regions for a wonderful day! This was the best tour I have ever taken, Simone picked us up right on time, she spoke amazing English and deliverd an unforgettable day. She was knowledgeable and fun to be with. She knew all the ins and outs. When the day was over we had made a new German friend. I can't recommend her enough. Simone was great. Extremely knowledgeable and informative. Because of her we had a factual and memorable trip to Munich. We would recommend her without hesitation. We travel a great deal and would consider her one of the best guides we have had. Simone was lovely! She graciously took one of her normal tours and adjusted it to fit our specific travel arrangements - even suggesting certain stops that we would have missed without her. She was very knowledgeable and I think I would have loved touring ALL of Germany with her instead of just the Linderhof Castle and Oberammergau areas. Highly recommend Simone! We had a wonderful day. Simone is an excellent guide and she looked after us really well. She is knowledgable, friendly, caring and is also fun to be with. The itinerary was very interesting and everything was superbly planned and timed. The trip exceeded our expectations! My husband and I really enjoyed our tour of Regensburg. Simone was very knowledgeable of Regensburg's history and moved at a nice pace as we toured this beautiful city. Simone was a GREAT guide.....she greeted us at our hotel with a German pastry to start the tour. It was our first time in Munich and the combination of history of the city interwoven with the tasting different foods and beers was a great way to start our visit in Germany. The best part of the tour was buying meats, cheeses and a pretzel from the local outdoor market and then sitting in the beirgarten with a cold beer and great conversation. We highly recommend Simone! excellent! great narration. highly recommend! We enjoyed our tour with Simone. She provided a great background on the sites we visited and we found her very engaging. We would take another tour with her and would recommend her to our friends. We used Simone to pick us up at the end of our Danube cruise in Vilshofen, take us on a tour of Regensburg and finally deliver us to our hotel in Munich. The overview tour of Regensburg was excellent along with insightful discussion of the city's history. I loved all our tours with TBL guides. Simone was knowledgeable and helpful taking us on a walking tour around the city. She even made reservations for us at a restaurant across from the glockenspiel for breakfast the next morning at a restaurant we wouldn't have ever seen but had a great view! We thoroughly enjoyed our tour with Simone. She seemed smart and was very personable. She answered all our questions (even before we knew what we wanted to ask!) and supplied us with a wealth of information. Her car was very comfortable too. We had a great tour of several small Bavarian towns and Neuschwanstein Castle on a dreary, cold & rainy day with Simone! She kept us on schedule perfectly, and her knowledge of various Benedictine churches and the Castle was impressive. She was personable, funny and engaging, and the 10 hour day zipped by. Plus, she took some great photos of my wife and I to make our day even more memorable! Simone was a great tour guide, both friendly and professional. We were able to ask her questions on Munich and German history and she could provide an answer without batting an eyelash. She took the walking tour at our pace.. I highly recommend her! Simone was a great guide. She showed us so many parts of the city that we would never have been able to see alone. She was so knowledgable about everything and was very easy to work with. I would highly recommend her. Simone was a delight. Prior to the tour, I arranged and discussed a lot about the itinerary with her and she was very helpful. During the tour, she was on time, cheerful and always ready with an answer. I asked for assistance with regards to wheelchair handling and she was okay with it. She made sure that we were not bothered with our limitations to be able to enjoy the tour. She brought us to a very wonderful restaurant for lunch. We had a superb time and learned a lot about Munich! Thanks Simone! Simone was very personable and also very knowledgeable about the area and Bavaria in general. We had a very enjoyable day. Well organized and easy to book tour. Simone was delightful and well informed and made the history interesting for both the adults and teens in our group. She arrived at our meeting spot with our first delicious "taste" and kept us eating and learning throughout the tour. Enjoyed her insight into present day Munich as well. She also gave us dinner recommendations. Highly recommend her services. Simone was an excellent and reliable guide. She was waiting for us at the airport and took us in and through Munich for a four hour private tour. Her knowledge was extensive and she had answers to all of our questions. You can't go wrong. Our tour guide Simone was on time, well spoken, knowledgeable and personal. Touring with her is like walking with your family. We were very comfortable in speaking and and asking questions. Our walking pace was just right. Of course the German food is very good and very filling. We recommendon this tour for anyone that likes food and walking. We had a wonderful time touring Nymphenburg Palace with Simone. She is very knowledgeable and a pleasant person to spend a half-day with.I would highly recommend this tour. Simone was a delight and so knowledgeable! She pointed out things and shared information that humanize the town, its history and its people. We had made an error concerning the date of our tour and she flexed her schedule to accommodate us. Then, in the rain and armed with our umbrellas, we explored the sites of Munich. An excellent adventure! Excellent overview tour. Simone has a great deal of knowledge about local history and customs and conveys it pleasantly. Simone was a WONDERFUL tour guide! 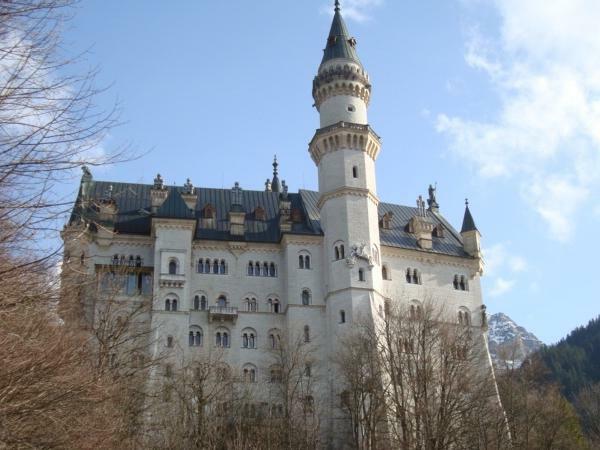 She is very knowledgeable about Neuschwanstein Castle and it's surrounding area. Our tour was both educational and enjoyable. Simone took us (in her lovely car) to places we would never have known to visit. We would highly recommend Simone to anyone wanting to visit Munich and/or Neuschwanstein Castle. Thanks Simone! Great Tour, Simone is very personable! An enjoyable way to visit Neuschwanstein while seeing other iteresting sights, and also having a little flexibility. We were there at a very busy time, but even then it was still fun. Awesome scenery on the drive too. Simone can also recommend other things to do, and places to eat. So ask your questions. Simone was very professional and gave us an excellent tour. it was like being with family. We had non-stop history and discussions the whole time. Amazing guide! Simone has a great sense of humor and is incredibly knowledgeable across a broad range of topics throughout history! Highly recommend her for all tours. Thank you for a great tour! Simone was EXCELLENT! Extremely knowledgable and able to talk about anything we were interested in.